Background and Objectives: Lack of scientific writing skills is believed to be a major obstacle in the course of research publication and dissemination by the Iranian researchers. Without following the globally accepted publication standards, dissertations, and projects cannot reach their final goal of being published and incorporated into practice. 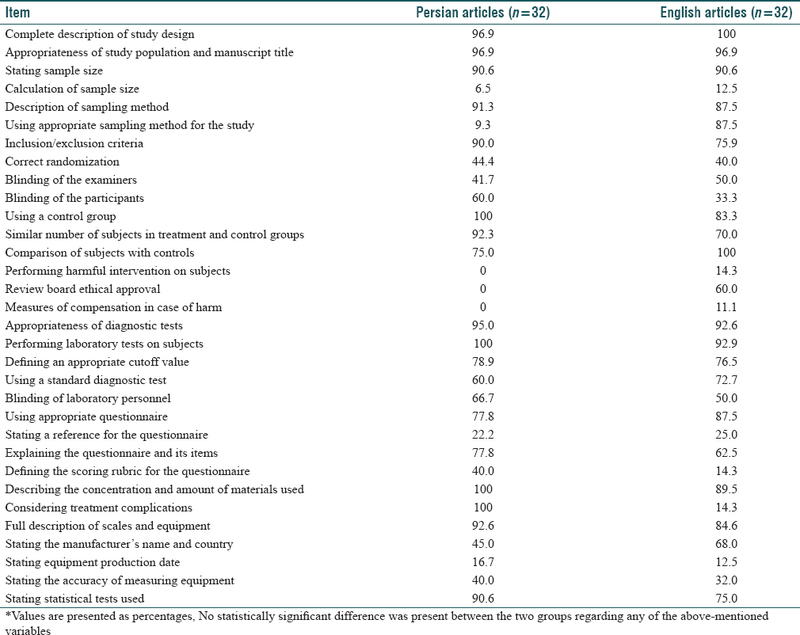 We aimed to compare the writing quality of a number of dental original articles written in Farsi and published in the Iranian journals with those written in English and published in international journals. Materials and Methods: In this analytical cross-sectional study, we selected 64 articles from six dental journals (three international English journals and three Farsi journals) by simple random sampling method. A list of 48 variables covering the study design, sampling method, subject allocation, ethical issues, interventions, measurements, and statistical methods was used to evaluate each article. The results were analyzed using Chi-square or Fisher's exact test. Results: Our results demonstrated that Farsi articles (n = 32) fulfilled 61.1% of our checklist criteria while English articles (n = 32) achieved a score of 59.1%, with no statistically significant difference (P > 0.05). Conclusion: We believe that the selected articles successfully reported most of the necessary elements. Their main shortcoming seemed to be the lack of clarification of details. Knowledge production and dissemination are among the top priorities for any academic institute and dedicates to a country's ranking in science. The number of publications in a country is a measure of its academic performance.,, Although this number is far from ideal in the Eastern Mediterranean countries, biomedical articles in Medline and ISI Web of Science have improved tremendously in the recent years in terms of publication rates, citations, and journal impact factors (IFs) [Figure 1]. IF and number of citations, in general, are other measures used in quality assessment. Adherence to the established scientific standards and structure in manuscript writing increases its chance of acceptance in a journal. A number of accepted resources are available regarding the standards of medical writing. Uniform Requirements for Manuscripts Submitted to Biomedical Journals is a set of instructions proposed by the International Committee of Medical Journal Editors, to be used as a universal measure to prepare and assess the quality of biomedical articles, and is widely accepted by many international journals and the World Health Organization. Many studies have evaluated the writing quality of different journal articles.,,, Among the different sections of an article, materials and methods section is of particular importance and is probably the reason for rejection of many submitted manuscripts. Given the scarcity of data regarding quality assessment of articles in the field of dentistry in Iran, we aimed to undertake a study to evaluate and compare the writing quality of the materials and methods section of a number of original research articles published in Farsi Iranian and English international journals. We randomly selected three to four articles from each volume. Each article was then evaluated and appraised using a 48-item checklist, regarding the quality of the materials and methods section, designed by our two methodologists. The checklist was organized into nine parts: part one consisted of four questions regarding the study design; part two consisted of seven questions regarding the sample size, sampling method, and inclusion/exclusion criteria; part three consisted of eight questions regarding subject allocation, randomization, concealment, control group, and matching; part four consisted of five questions regarding ethical considerations; part five consisted of five questions regarding diagnostic and laboratory tests; part six consisted of seven questions regarding the use of questionnaires; part seven consisted of seven questions regarding treatment interventions; part eight consisted of four questions regarding measurements and equipment; and part nine consisted of a question regarding statistical tests. This checklist was reevaluated by our colleagues in the oral medicine department, and its internal and external validity was assessed. Three reviewers including a dental student, an oral medicine specialist, and a methodologist independently scored each article. Any discrepancy in scores was discussed and resolved in a group discussion. After completion, frequencies and percentages were calculated for each set of articles, and groups were compared using Chi-square or Fisher's exact test. Our results show that the 32 selected Farsi articles had a mean overall score of 61.1%, slightly more than the score of 59.1% for English articles (P > 0.05). Seven of 48 items in the checklist showed significantly different scores (P< 0.05) between the two groups. These items included questions about the direct statement of the study design, correct description of study design, suitability of the design for answering the research question, obtaining informed consent from the participants, using predefined questionnaires, accurate presentation of drugs/materials used, and using generic names of medications. Other items did not show any statistically significant difference between the two groups [Table 1]. We compared 64 original articles from six Farsi and English international journals and found that more than half of our checklist items were covered, similarly between the two groups, in the materials and methods section. Quality assessment, in general, is an inseparable part of research and publication. This is where common standards of research reporting come into play. Consolidated Standards of Reporting Trials (CONSORT) is an example, which is a set of recommendations for reporting clinical trials. A number of studies have evaluated the writing quality of published articles and their abstracts. Narine et al. in 1991 evaluated the abstracts of original research papers published in the Canadian Medical Association Journal (CMAJ). They calculated a score of. 63 (out of 1), showing that nearly a third of expected information is not covered in the abstracts. They concluded that most abstracts contain enough information according to publication standards, but they lack enough details to help the reader gain a comprehensive understanding of the study. In another study in 2006, abstracts of randomized controlled trials in the field of dentistry published in the journals of Lancet, Journal of the American Medical Association (JAMA), and the New England Journal of Medicine were scored according to the CONSORT recommendations. The authors concluded that quality of the abstracts is suboptimal, necessitating an improvement in this field. Wong et al. evaluated the abstracts of 54 research papers published in JAMA, CMAJ, and The BMJ in 2001 and 2002. They reported that the consistency and the framework in these abstracts have improved significantly compared to the abstracts published in 1991 and 1992. In a 2003 study, the abstract books of three clinical dermatology journals were evaluated, leading to a conclusion that unstructured abstracts are poorer in quality than structured abstracts. Bakhtiari et al., moreover, conducted a study comparing the writing quality of the results section of published original articles in Farsi journals to English journals. They found no significant difference between those articles. Our results demonstrated that while nearly half of the quality items were not met by the manuscripts in the materials and methods section, no significant difference was observed between Farsi and English articles. Given the growing number of biomedical publications, readers now have a wider choice, favoring the selection of articles with clear descriptions and details. The authors believe that by following common reporting standards, manuscripts will improve significantly in the materials and methods section, leading to clearer understanding of the study and easier dissemination of knowledge. We evaluated the journals published in 2005-2007. We suggest that a similar future study evaluating more recently published journals be conducted, which will provide an updated insight into the possible improvement of writing quality, as well as a comparison with our findings. Although there was no significant difference in the quality of the materials and methods section between the selected Farsi and international journal articles, the authors believe they failed to meet the expected reporting standards, reflected by their suboptimal scores. We thus urge academic institutes to improve reporting quality by following a common reporting standard in this section, to provide a clearer description of the study for the readers. We acknowledge Dr. Somayyeh Azimi from the University of Western Australia for her assistant and advice. Mansouri R. Growing number of research papers in recent years. Rahyaft J 1993;4:12-5. Desolla Price DJ. Little Science, Big Science. New York: Columbia University; 1963. p. 109-19. Mansouri R. Scientific Development in Iran. 1st ed. Ch. 1-3. Iran: UNESCO National Commission Publication in Iran; 1994. p. 10-100. Sharifi V. Quality evaluation research. New Cogn Sci 2003;20;108-10. Wang L, Li Y, Li J, Zhang M, Xu L, Yuan W, et al. 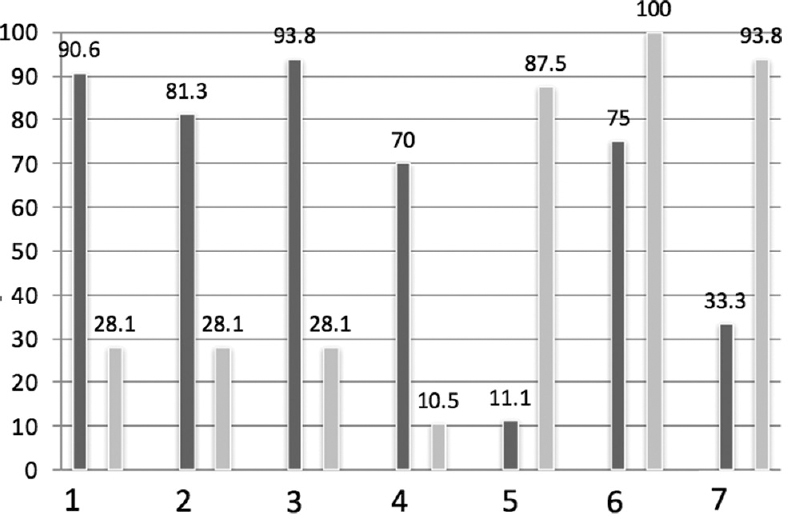 Quality of reporting of trial abstracts needs to be improved: Using the CONSORT for abstracts to assess the four leading Chinese medical journals of traditional Chinese medicine. Trials 2010;11:75. Narine L, Yee DS, Einarson TR, Ilersich AL. Quality of abstracts of original research articles in CMAJ in 1989. CMAJ 1991;144:449-53. Gøtzsche PC. Methodology and overt and hidden bias in reports of 196 double-blind trials of nonsteroidal antiinflammatory drugs in rheumatoid arthritis. Control Clin Trials 1989;10:31-56. Pocock SJ, Hughes MD, Lee RJ. Statistical problems in the reporting of clinical trials. A survey of three medical journals. N Engl J Med 1987;317:426-32. Berwanger O, Ribeiro RA, Finkelsztejn A, Watanabe M, Suzumura EA, Duncan BB, et al. The quality of reporting of trial abstracts is suboptimal: Survey of major general medical journals. J Clin Epidemiol 2009;62:387-92. Wong HL, Truong D, Mahamed A, Davidian C, Rana Z, Einarson TR, et al. Quality of structured abstracts of original research articles in the British Medical Journal, the Canadian Medical Association Journal and the Journal of the American Medical Association: A 10-year follow-up study. Curr Med Res Opin 2005;21:467-73. Dupuy A, Khosrotehrani K, Lebbé C, Rybojad M, Morel P. Quality of abstracts in 3 clinical dermatology journals. Arch Dermatol 2003;139:589-93. Bakhtiari S, Alavi K, Alizadeh Dakhel Z, Azargashb E, Azimi S, Taheri JB. Quality of the results section of original dental articles published in National Farsi and international English journals. Beheshti Univ Dent J 2014;32:159-64.